U.S. 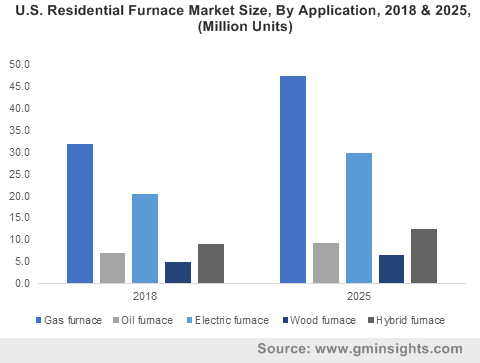 Residential Furnace market size was over USD 115 billion in 2018 and industry expects demand of above 100 million units by 2025. Growing investments in construction sector supported by consumer inclination towards energy efficient solutions to save power consumption is anticipated to stimulate industry growth. Increasing power consumption and stringent environment regulations limiting energy usage may further fuel U.S. residential furnace market size. U.S. housing units were over 135 million in 2017 and is anticipated to witness up rise owing to growing construction and rising need for independent houses, which may boost U.S. residential furnace market size. These products are extensively used in residential buildings to regulate temperature in winter and summer by providing consistent air circulations, which may drive product demand by 2025. Continuous innovation including use of inducer fan in the furnace to reduce waste and save power is anticipated to propel industry growth. New and modern furnace automatically adjusts itself to provide right amount of heat for maintaining temperature of thermostat and control system, thereby propelling industry growth. Temperature variations in U.S. regions result in extreme hot or cold weather which stimulates residential furnace demand. These products work at full capacity in cold days and operates at a low power to provide warm air. These factors are likely to fuel product demand. It helps in saving time, cost, power and construction space along with providing comfort and high efficiency. Features including high Annual Fuel Utilization Efficiency (AFUE) along with presence of variable speed motor blower results in quite operation, which removes unnecessary noise and sound. These factors are likely to boost U.S. residential furnace market size in projected timeline. Rising disposable income has led to growth in living standards and consumer are focusing on new and emerging products to make houses more comfortable for ease of living. These products have continuous airflow which can eliminate hot & cold spots and also provide advanced summer humidity control and warmth in winter season which may boost U.S. household furnace market size in forecast timeline. Gas residential furnace is not good for milder temperature and has no middle setting which may hamper industry growth. High repairing cost of electric based systems along with its high running cost and low efficiency in heating large spaces may to impact U.S. household furnace market price trend, thereby affecting industry profitability. U.S. residential gas furnace market size is anticipated to surpass USD 80 billion by 2025. It runs at low cost due to moderate natural gas prices and has ability to heat household area more quickly as compared to electric furnace. It is extensively used in areas which experience extreme winter temperatures due to the presence of combustion chamber inside gas furnace which reaches high temperature, thereby giving warmth to the buildings. U.S. electric residential furnace market size is anticipated to witness gains over 5.5% by 2025. It has low purchase price and has simple technology which makes it easier to operate without any complexities. Coils used in these systems are relatively cheaper and consumer spending becomes 25% to 30% less on electric furnace models as compared to gas systems. U.S. residential furnace market size from single family application is anticipated to witness gains over 5% by 2025. Availability of easy loans rise in new construction activities and growing need for independent houses should stimulate product demand. Natural gas furnace is generally used in single family buildings due to its low operating cost along with its high output, thereby propelling industry growth. California residential furnace market size is anticipated to reach 15 million units by 2025. Household furnace do not depend on heat from outside air and can perform its operations in extreme hot or cold weather, thereby propelling product demand. Texas residential furnace market size is may register gains over 4.5% by 2025. Household furnaces care moderately used in southern region due to slight fall in the temperature which can be managed without the use of these system. However, other regions in Texas face a relatively high fall in the temperature and can get cold, thereby driving product demand. New York residential furnace industry size may register gains over 5% by 2025. The region has diversified climate across the year which amplifies demand for energy efficient and high output systems like gas furnace. It has high installations cost; however, it has low running cost and high efficiency, making it an ideal system for heating & cooling purpose, thus propelling product demand. Florida household furnace market size register steady gains as this part of the country experience mild temperature; however, weather can get cold and chilly which propels demand for furnace systems to keep the house comfortable and warm. Furnace is a better choice for this region as compared to heat pumps owing to its versatility of operating through numerous throughputs including oil, gas, electricity and wood, thereby driving product demand. 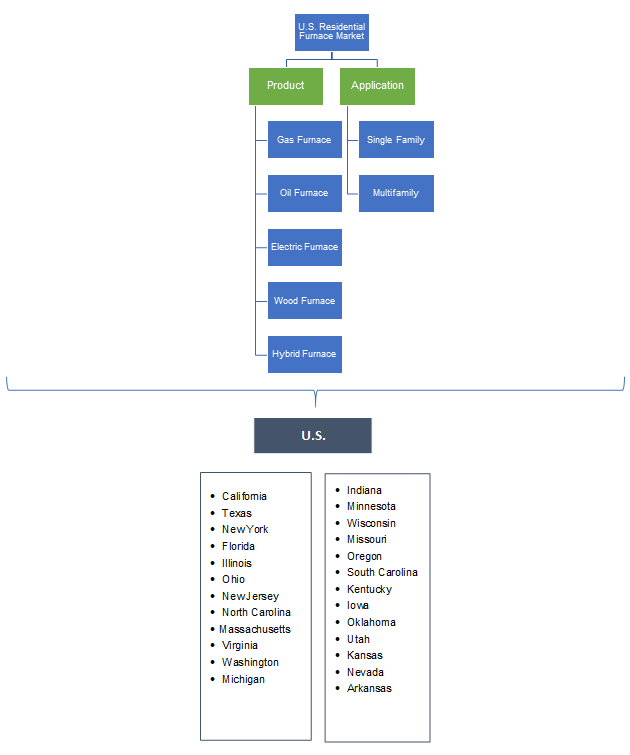 U.S. residential furnace market share is slightly fragmented and competitive with major industry players includes Carrier, York, Luxaire, Lennox, Rheem, Bryant, Daikin, Rudd, Boyer Furnace and Amana. Companies are focusing on lowering down operating cost of the products along with maximizing output to increase efficiency of the system. Producers Daikin, Luxaire, Rudd, are also developing technologies like thermally driven furnace system which uses solar as input, making them highly energy efficient by eliminating electricity cost. Household furnace systems used in households for providing heat or cool air in order maintain the temperature of buildings. It works by puffing heated air through ducts which delivers warm air in rooms throughout building. These products can be powered with electricity, oil, gas & wood and can have efficiency of up to 98%. Fuel efficiency of these systems are measured in Annual Fuel Utilization Efficiency (AFUE). These products provide heat through fluid movement and does not require chimney for their operations, thereby propelling product demand.